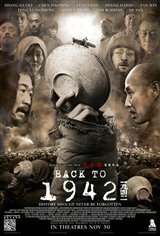 great movie, the director skillfully made use of the situation in question to reflect the hardship that was suffered by the Chinese people during the period concerned. The director in one of the intervirews compared the 1942 famine with the 1964 famine, I am not sure if he were intented to bring up the subject of the role of corrupt officials in China throughtout the centuries. The movie has done a good job in highlighting the human weaknesses; greed, abuse of power, non assertiveness, self centredness and selfishness. Indeed a history worth watching!! The directing style is as good as Lincoln!